Hint: If you click on the photo collage it will enlarge. Outside the walls of the Taj Mahal lie the not-so-mighty alleys and lanes of today's Agra. Leather-shoe shops [I bought a yellow pair, Donna a pink pair], marble shops containing simple mortar and pestles, shops with beautiful inlaid tables and treasure boxes, carved jaali work where the light of a candle can pierce and illuminate its fine pattern. The descendents of the Taj Mahal craftsmen still plying their trade, though given little of the respect of the famous monument behind. Crowding our walking was a small army of touts - hawking for every kind of transportation, auto and bicycle rickshaws, horse tongas, and camel carts are the four choices to get us to the car park! 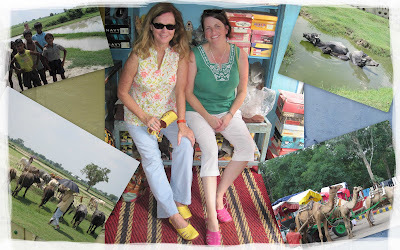 Since we had enjoyed the camel ride in, we walked back to the car, and through the winding lanes found painted mud walls of cloud blue, powder blue, cereluan blue, jade green and rose peach. It was worth the walk! I took pictures of all the blues and decided to repaint my Delhi office somewhere between powder and cloud blue.. a puff of color, a promise of a memory. It was a wonderful morning of inspiration and relaxation at the ancient shrine of love! Love the colored drawings on this homepage...Who is the artist? Hi April,great to see your blog and be a part of it!Beatiful Taj pictures and lovely nwrite up...looks like you both had a good break...shoes are awesome too! April, thanks for posting photos. I too, have never been to India, as I am sure many of us have not, what a wonderful experience for all of you. When I was reading the post the first time, there were no photos available, and I was disapointed. But now I have found them, and they are lovely. And hello to beautiful Boston. I think the best way for your daughter to contact me is by emailing our website and leaving her email address/phone with customer service. She should go to -questions@aprilcornell.com - that way she doesn't have to publish her contact information. I am in Delhi for another week, but I come quite frequently. What is she doing in Delhi?Probably enjoying the monsoon rains today!